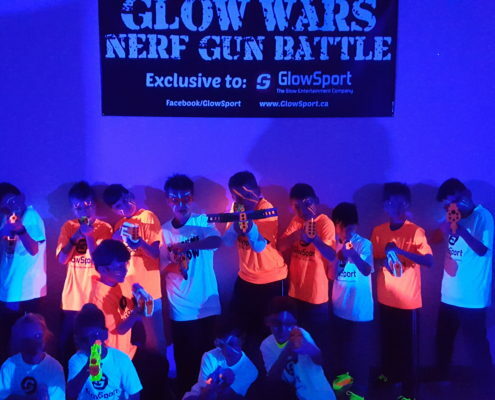 Take things to another planet with the famous Glow Wars Nerf Gun Battle Birthday where we use camouflage netting, obstacles and smoke to create a battlefield setting! This event is good for everyone 6+, team parties, team building and even adult parties. 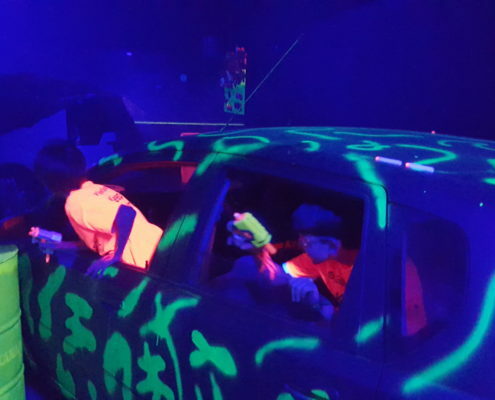 This Location is a brand new GlowSport Nerf Gun Battle Arena with used cars the kids climb through, sandbag bunkers and a GUN STORE where kids exchange guns like a civilized marketplace. Let us take care of the mess while providing drinks and pizza (Add an XL pizza to your package for $25) after leaving the battlefield. The cost is $300.00+HST for 2 hours with a 15 participant limit. 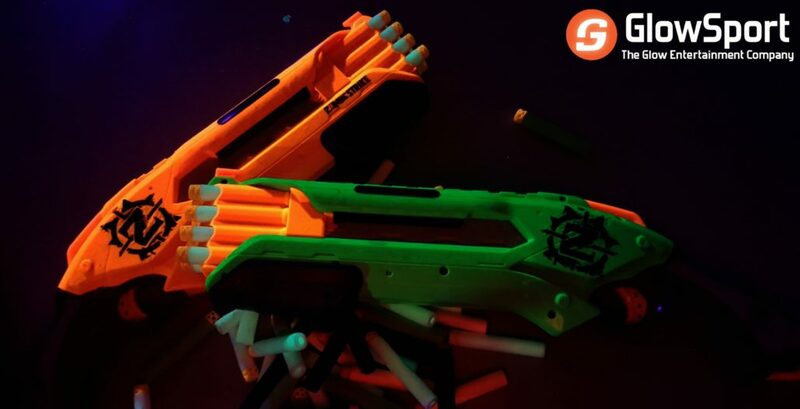 The first hour and a half are allotted for the Glow Wars Nerf Gun Battle leaving 30 minutes at the end for cake, food and presents. You are welcome to bring any food you wish for the party. The cost is $350.00+HST for 2 hours with a 20 participant limit. 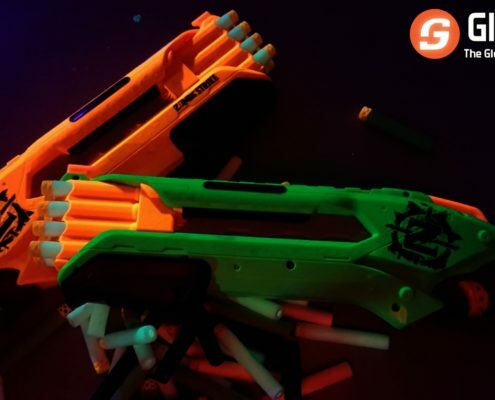 The first hour and a half are allotted for the Glow Wars Nerf Gun Battle leaving 30 minutes at the end for cake, food and presents. You are welcome to bring any food you wish for the party. The cost is $400.00+HST for 2.5 hours with a 15 participant limit. The first hour and a half are allotted for the Glow Wars Nerf Gun Battle leaving 60 minutes at the end for cake, food and presents. Includes 2 XL pizzas (Cheese or Pepperoni), popcorn, chips and a juice for each participant. Also includes plates, cups, utensils and napkins. The cost is $500.00+HST for 2.5 hours with a 20 participant limit. The first hour and a half are allotted for the Glow Wars Nerf Gun Battle leaving 60 minutes at the end for cake, food and presents. Includes 3 XL pizzas (Cheese or Pepperoni), popcorn, chips and juice for all participants. Also includes plates, cups, utensils and napkins. The cost is $350.00+HST for 2 hours with a 10 participant limit. The first hour and a half are allotted for the Glow Wars Nerf Gun Battle leaving 30 minutes at the end for cake, food and presents. This is a partner package where your party would compete against another group of ten before being split back into separate groups for the after party. 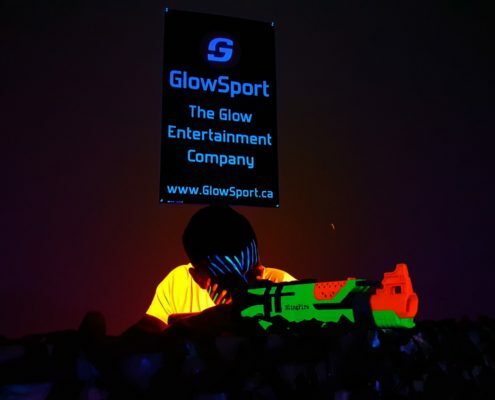 (If no one books at the same time as you it becomes a private party) GlowSport provides 2 XL pizzas (Cheese or Pepperoni), popcorn, chips and juice for each participant. Also includes plates, cups, utensils and napkins. Let’s Glow painting. Whether painting on canvass, paper or even the face we have the best quality paints at our disposal including the world’s best quality non-toxic face/body paint. 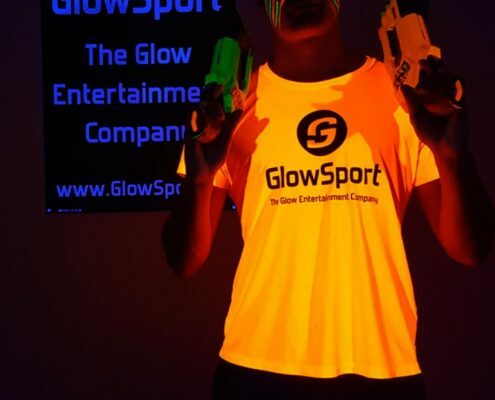 Join us for a glow paint party everyone will be talking about for while! This package costs $200.00+HST and runs for 1.5 hours for up to 10 participants. Start off the party with glow face/body painting while the tunes fill the room with energy. After 15-20 minutes we start the glow picture painting where kids paint on glowing paper. This package includes a small canvass for each participant to paint on and take home after. 30 minutes are allotted at the end for cake food and presents, you’re welcome to bring what you wish! This package costs $250.00+HST and runs for 1.5 hours for up to 15 participants. Start off the party with glow face/body painting while the tunes fill the room with energy. After 15-20 minutes we start the glow picture painting where kids paint on glowing paper. This package includes a small canvass for each participant to paint on with our cool glowing paint and take home after. After everyone finishes painting everyone heads to the party room to enjoy whatever food you desire to bring! This package costs $350.00+HST and runs for 1.5 hours for up to 20 participants. Start off the party with glow face/body painting while the tunes fill the room with energy. After 15-20 minutes we start the glow picture painting where kids paint on glowing paper. This package includes a small canvass for each participant to paint on with our cool glowing paint and take home after. After everyone finishes painting everyone heads to the party room to enjoy whatever food you desire to bring! This package costs $300.00+HST and runs for 2 hours for up to 10 participants. Start off the party with glow face/body painting while the tunes fill the room with energy. 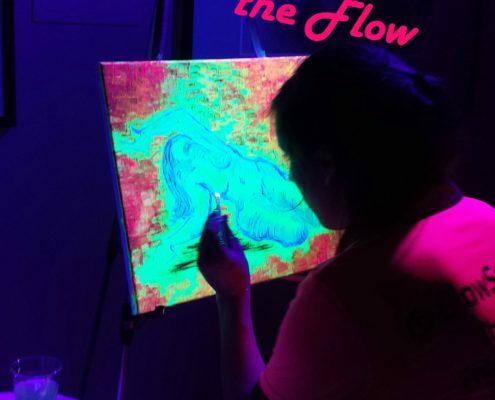 After 15-20 minutes we start the glow picture painting where kids paint on glowing paper. This package includes a small canvass for each participant to paint on and take home after. 60 minutes is allotted at the end for cake food and presents. Includes 2XL Pizzas (Cheese or Pepperoni), popcorn, chips and juice for each participant. Also includes plates, cups, utensils and napkins. This package costs $350.00+HST and runs for 2 hours for up to 15 participants. 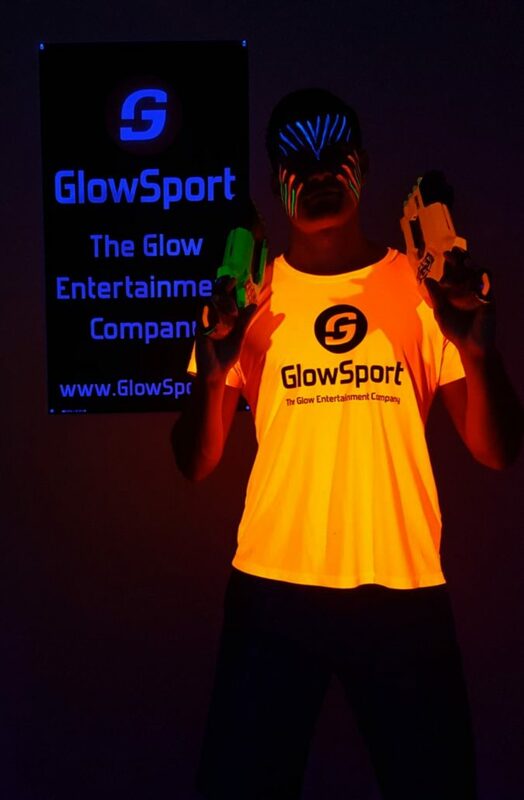 Start off the party with glow face/body painting while the tunes fill the room with energy. 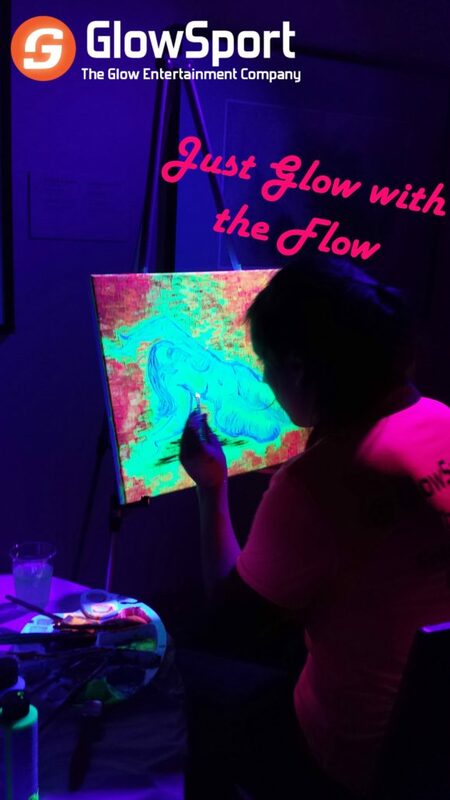 After 15-20 minutes we start the glow picture painting where kids paint on glowing paper. 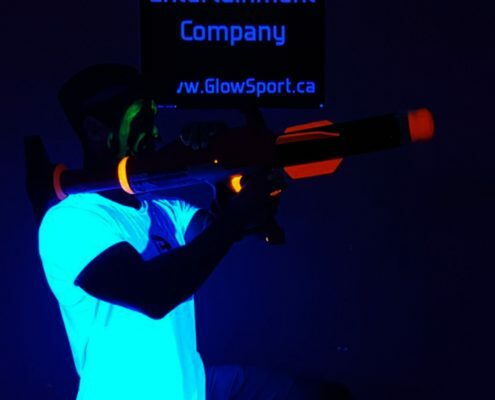 This package includes a small canvass for each participant to paint on using our awesome glow paint and take home after. 60 minutes is allotted at the end for cake food and presents. Includes 3XL Pizzas (Cheese or Pepperoni), popcorn, chips and juice for all participants. Also includes plates, cups, utensils and napkins. This package costs $500.00+HST and runs for 2 hours for up to 20 participants. 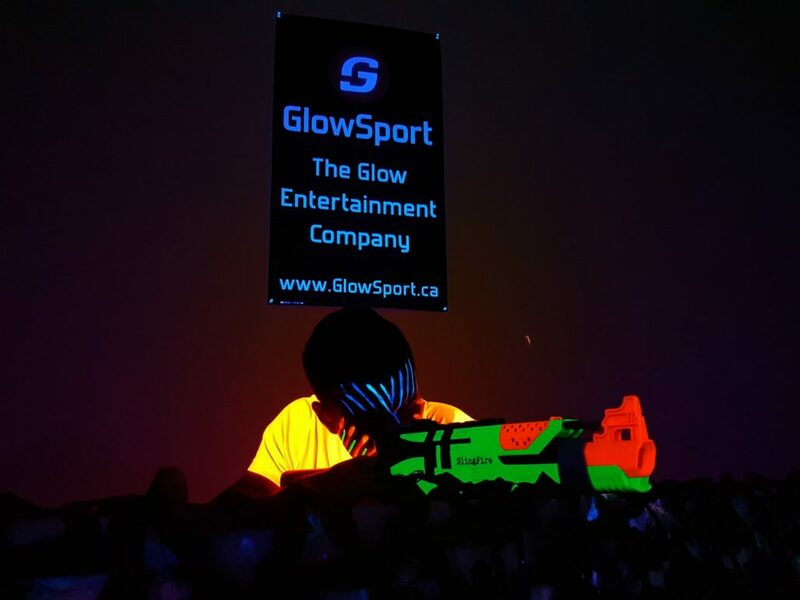 Start off the party with glow face/body painting while the tunes fill the room with energy. After 15-20 minutes we start the glow picture painting where kids paint on glowing paper. This package includes a small canvass for each participant to paint on and take home after. 60 minutes is allotted at the end for cake food and presents. Includes 3XL Pizzas (Cheese or Pepperoni), popcorn, chips and juice for all participants. Also includes plates, cups, utensils and napkins. This adult paint package costs $35.00/participant for 12-20 participants and runs for 2 hours. Grab your favourite beverage, best friend, turn the lights off and turn up the energy! 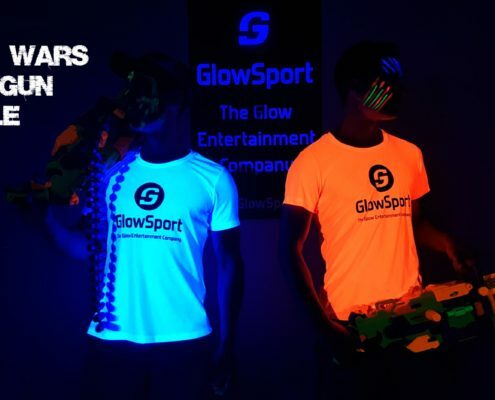 All glow paint & equipment, large bleached painter’s canvasses, music and instructors are provided by GlowSport for the event. For this event, come to one of our locations or we will come to your location (House, rented community center, bar, etc.) and set up everything except the alcohol! This package includes a professional painter to lead the session. UPGRADE TO ULTIMATE GLOW ($40) FEATURING – Nail painting, eye shadow, mascara, eye liner, hair chalk, hair gel and more available by request only. 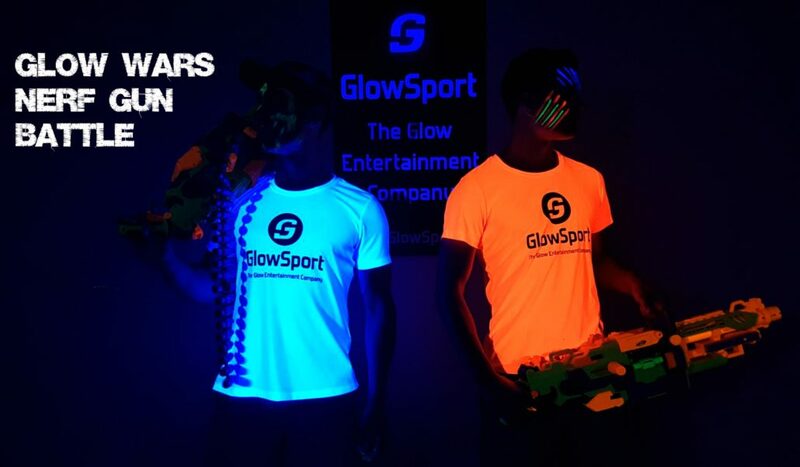 Who’s ready to glow?! Whether painting on canvass, paper or even the face we have the best quality paints at our disposal including the world’s best quality non-toxic face/body paint. 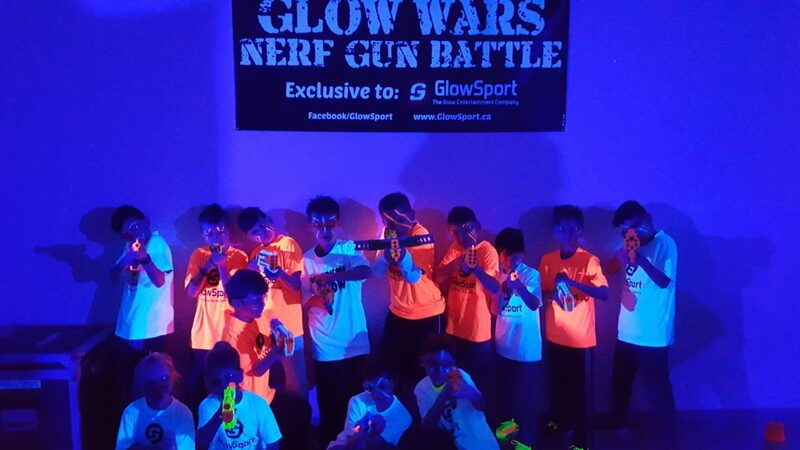 Our Glow Wars Nerf Gun Battles are taking over the city and combining these elements makes for one incredible party! This package costs $350.00+HST and runs for 2 hours for up to 15 participants. 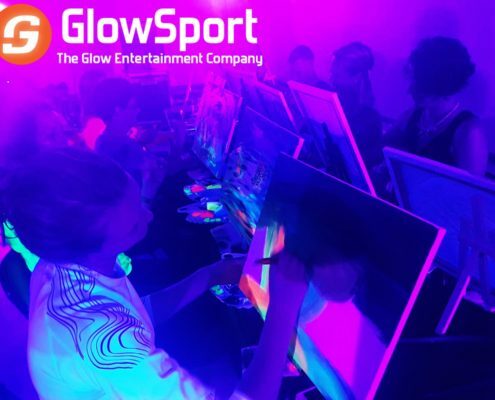 Parties start off by painting a glowing canvass using our awesome glowing paint! This package includes a small canvass for each participant to paint on and take home after. After painting is finished the group separates into two teams and a Nerf Gun Battle ensues. Once there are 30 minutes left, the party heads to the party room for cake food and presents, whatever you wish to bring! This package costs $400.00+HST and runs for 2 hours for up to 20 participants. 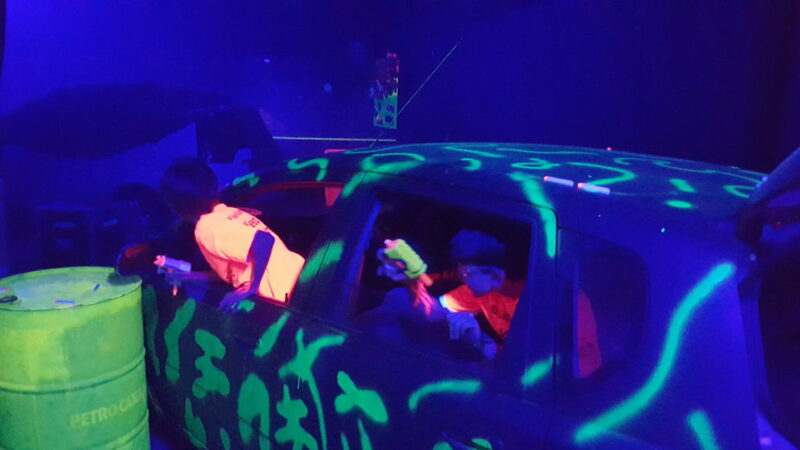 Parties start off by painting a glowing canvass using our awesome glowing paint! This package includes a small canvass for each participant to paint on and take home after. After painting is finished the group separates into two teams and a Nerf Gun Battle ensues. After painting is finished the group separates into two teams and a Nerf Gun Battle ensues. Once there are 30 minutes left, the party heads to the party room for cake food and presents, whatever you wish to bring! This package costs $450.00+HST and runs for 2.5 hours for up to 15 participants. 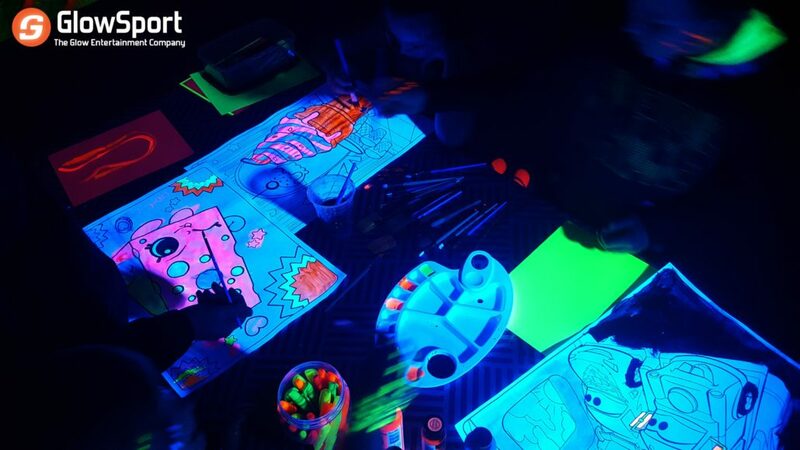 Parties start off by painting a glowing canvass using our awesome glowing paint! This package includes a small canvass for each participant to paint on and take home after. After painting is finished the group separates into two teams and a Nerf Gun Battle ensues. Once there are 60 minutes left, the party heads to the party room for cake food and presents. Includes 2XL Pizzas (Cheese or Pepperoni), popcorn, chips and a drink for each child. Also includes plates, cups, utensils and napkins. This package costs $550.00+HST and runs for 2.5 hours for up to 20 participants. 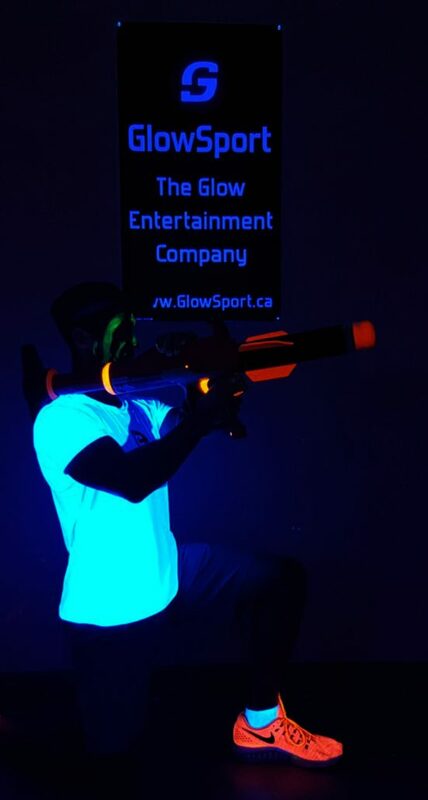 Parties start off by painting a glowing canvass using our awesome glowing paint! This package includes a small canvass for each participant to paint on and take home after. After painting is finished the group separates into two teams and a Nerf Gun Battle ensues. Once there are 60 minutes left, the party heads to the party room for cake food and presents. Includes 3XL Pizzas (Cheese or Pepperoni), popcorn, chips and a drink for each child. Also includes plates, cups, utensils and napkins. This package costs $300.00+HST and runs for 2 hours for up to 10 participants. 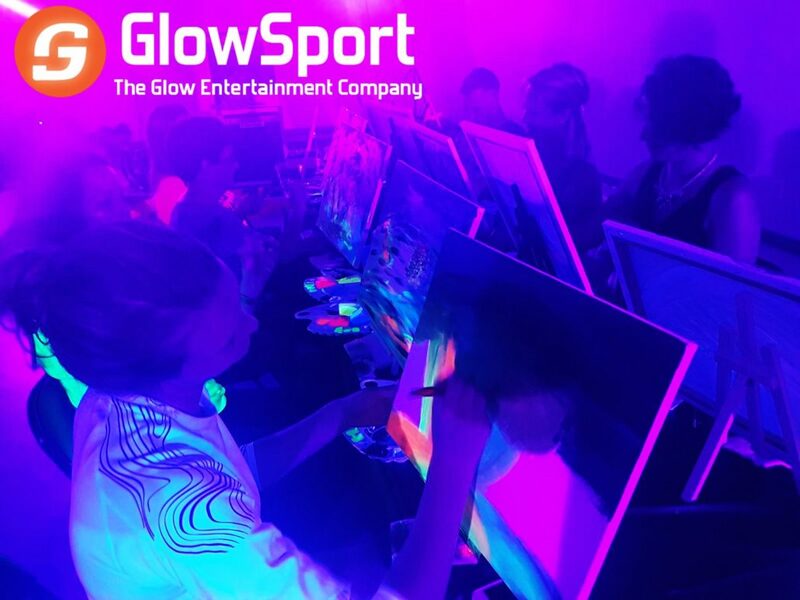 Parties start off by painting a glowing canvass using our awesome glowing paint! This package includes a small canvass for each participant to paint on and take home after. After painting is finished the group separates into two teams and a Nerf Gun Battle ensues. After painting is finished the group separates into two teams and a Nerf Gun Battle ensues. Once there are 30 minutes left, the party heads to the party room for cake food and presents, whatever you wish to bring! This package costs $400.00+HST and runs for 2.5 hours for up to 10 participants. 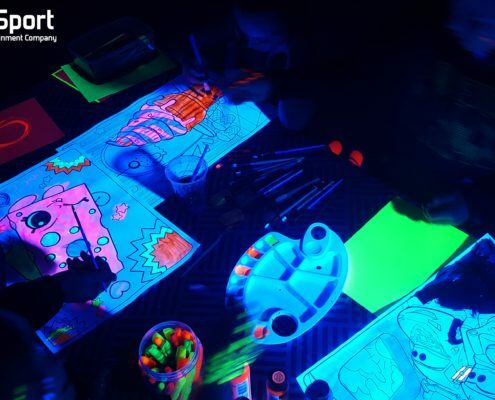 Parties start off by painting a glowing canvass using our awesome glowing paint! This package includes a small canvass for each participant to paint on and take home after. After painting is finished the group separates into two teams and a Nerf Gun Battle ensues. Once there are 60 minutes left, the party heads to the party room for cake food and presents. Includes 2XL Pizzas (Cheese or Pepperoni), popcorn, chips and juice for each child. Also includes plates, cups, utensils and napkins.